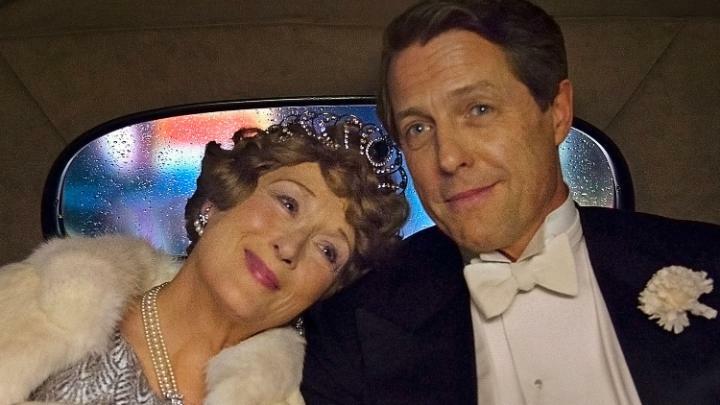 Stephen Frears directs Meryl Streep, Hugh Grant and Simon Helberg in the biopic Florence Foster Jenkins. Florence was a New York socialite, the founder of The Verdi Club and a patron of the music scene in the city. Florence’s record The Glory of the Human Voice was chosen by David Bowie as one of his top 25 vinyl possessions and Florence was also laughed at by many who dubbed her the women with the worst singing voice. Frears having previously tackled aging divas with Helen Mirren in The Queen and Judi Dench in Philomena is the perfect choice to bring to the big screen the life of this enigmatic artist and who better than Meryl Streep to play her. We all know the basic premise – Florence Foster Jenkins had an unusual singing voice and in comparison to traditional classically trained musicians she sounded terrible. The trailers have masterfully built up the anticipation of just how terrible did Florence sound especially how will Meryl, who has a better than average singing voice as witnessed in Mama Mia! and Into the Woods, take on the bad singing. From the opening sequence you are waiting for her to dive into her singing and it does happen, the anticipation builds. You see Florence play the angel of inspiration with a golden harp and the Viking Valkyrie in stage productions and you still waiting on bated breath to hear her sing the first note. It it not until Simon Helberg as Cosme McMoon ( Howard from The Big Bang Theory) is selected as the pianist to assist Florence that you are rewarded to the truly atrocious singing. It is so bad that with every progressing note you are overtaken by a fit of giggles, as the notes get more off key so do the guffaws – you are no longer politely sniggering into your palm, I was howling both with laughter and the stitch in my side from trying to stifle the laughing. Meryl is masterful! You see her earnestly try to sing and the looks of surprise from Cosme as sounds that cannot possibly be human come out of Florence’s mouth. For Florence it might have been natural but it must take an exceptional amount of talent to be this bad on purpose and no one but Meryl could have taken this on. She makes you feel bad for Florence – about her delusions of grandeur but also about her naivety and innocence about the whole thing. Meryl is very ably supported by her doting husband, a failed Shakespearean actor St Clair Bayfield played by Hugh Grant. Grant was lured out of retirement by Frears by the script and he is marvellous in this role. There are more layers to Bayfield than meets the eye at the outset. His devotion to Florence is complete but he is not without his flaws and towards the end you are left questioning if they really are flaws at all. Simon Helberg is unrecognizable as the soft spoken and delicate Cosme McMoon who is a stark contradiction to how he plays Howard Wolowitz on the hugely popular The Big Bang Theory. Here Helberg makes no eye contact, talks in dulcet tones and is constantly in a fit of giggles. Being the 1940s there are mere hints at McMoon’s sexuality and it is dealt with deftly. Alexandre Desplat is the other supporting character who does well to lift the story with his skilful background score. Where I found the movie lacking was in the character actors who played the bit parts but were curcial to the proceedings. Nina Arianda as the showgirl Mrs Agnes Stark and Rebecca Fergusson as the mistress Kathleen are beautiful to look at and while not particularly bad they are less than believable in their roles. Perhaps a little more time devoted to their character would have helped. That minor misstep aside what really shines is the story and how Frears slowly unravels it. You find out a little bit about each of the characters slowly as the story progresses. You are given an insight into Florence’s backstory, her idiosyncrasies, her penchant for dressing in outfits laden with feathers and sequins, and her delusions of youth and grandeur as she dresses up and dances awkwardly while performing at Carnegie Hall. There is no way this is not going to be Nomination number 20 for Meryl Streep because she is incredible as Florence Foster Jenkins and she manages to make you fall in love with the New York socialite with the worst singing voice every. There are plenty of laugh out loud moments and sweet tender moments that tug at your heart strings. A beautiful devoted romance between Streep and Grant and a stellar turn by Simon Helberg. Try not to scour the internet for Meryl’s singing as Florence Foster Jenkins – let yourself be surprised in the theatre and trust me you will be doubling over with laughter when you first hear the sounds!